Interacting with Facebook, YouTube, Flickr, Spotify, Vimeo, Wikipedia, SoundCloud, Twitter is now possible from within a single image. 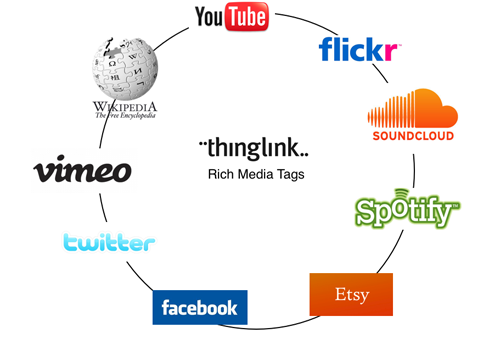 Our free ThingLink tagging tool is nearly one year old. During the first half of this year we put some effort in making it stable and easy to use, and to be perfectly honest with you, we think we have succeeded quite well. During the second half of the year we have invested in making our tags more interesting. Previously, and mostly still, they have been links that directs the viewer to another site. Now, with this launch, our tags can transform into people’s favorite services that can be consumed on the image without having to leave the page. This is a new powerful form of reader engagement and conversion that you will be able to monitor in real time. So from today, web publishers, brands and bloggers can make their images more engaging with our Rich Media Tags for Facebook, YouTube, Flickr, Spotify, Vimeo, Wikipedia, SoundCloud and Twitter; each of which can be used to tell the story behind anything. Here are some examples that have inspired us. Happy tagging!